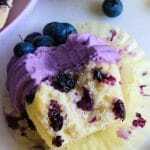 One bowl recipe for fluffy and lemony cupcakes exploding with blueberries, topped with blueberry cream cheese frosting! For times when you only want two cupcakes! Without having to worry about 22 leftovers staring at ya! The other day I had this huge craving for a bright, fruity and cheerful cupcake. A cupcake frosted with two buckets of cream cheese frosting! I was lazy enough to break out that mixer. And didn’t feel like baking a full batch of cupcakes either. But happened to have a small block of cream cheese hanging out in my refrigerator. What would you call it all? Fate? The stars aligned? And whole universe signaled me to carve my craving for these AmazzzinG cupcakes? I listened to all those signs. The lemon blueberry cupcake recipe today is so simple! One bowl. Two cupcakes. No fancy ingredients. No hassle. And they come out so light, fluffy and spongier than a sponge ball. No seriously! I never kid around cupcakes. All that credit goes to cornstarch. A trusty sidekick to lemons! I wept tears of joy developing this recipe including cornstarch. It’s that good. So please please please do not skip it! The frosting is so dreamy and looks super fancy with all that gorgeous P-U-R-P-L-E color. It starts with blueberry jam. Now you can use homemade/store bought. But just make sure it’s not very melty. If you find the juices are separating, microwave it in small increments to make it like a thick paste. Before piping the swirls, chill the frosting in refrigerator for 15-20 minutes. This will help the frosting stay firmer as you work with it. This isn’t a very firm frosting. Rather it’s super creamy and soft. If swirls sound like too much work, you can even pipe it using a round wilton tip #12. I added a drop of purple gel food color to get this color. But just be careful not to add to much at a time. Sometimes we just cannot handle full batch lemon cupcakes. This is when easy lemon cupcakes come into play! Looking for more small batch recipes? Try my super cute berry swirls and sprinkles loaded loaf cake next. Or how about one giant strawberry cookie? Want to try a batch of non-vegans approved vegan choc-chip cookies? You also don’t wanna miss out on these refreshing breakfast treats! Layered mango and berry overnight oats! So hearty and fruity. Cupcakes for two of you! 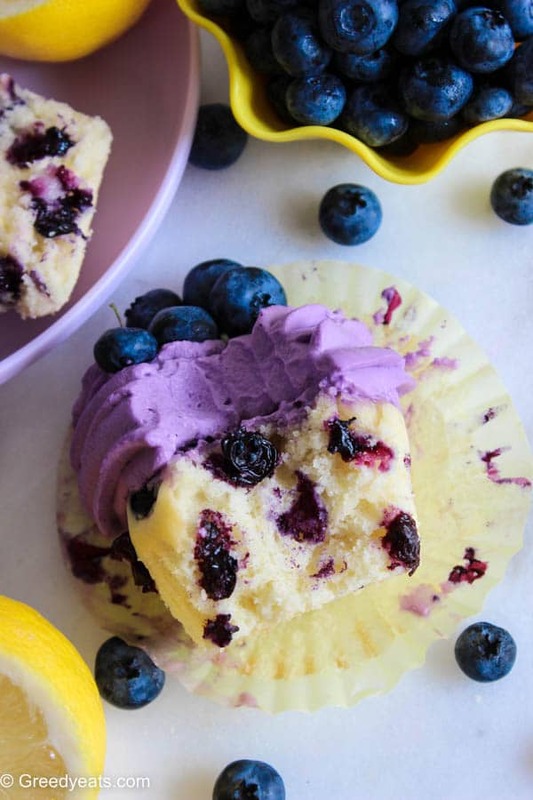 One bowl recipe for fluffy and lemony cupcakes exploding with blueberries, topped with blueberry cream cheese frosting! Microwave all the ingredients in small increments (stirring the sauce in bettween) till a thick paste is formed. When it coats the back of your spoon well, it is ready. We will add 1/2 tbsp of strained and cooled sauce in our frosting. 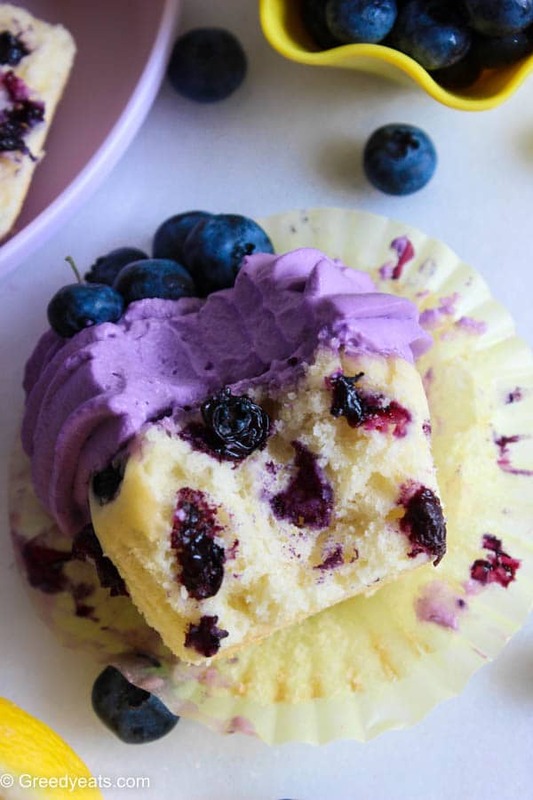 You can drizzle the rest onto your frosted cupcakes for an intensified blueberry flavor. 1. Preheat your oven to 375 deg F and line a muffin pan with 2 liners. Set aside. 2. In a small mixing bowl add egg and sugar, beat until fluffy, pale and light. Next add oil, lemon juice and zest. Also add in extracts. Combine well. 3. Using a sifter, sift flour, baking powder, cornstarch and salt in the wet ingredients. Fold alternating with milk. Also fold in the berries saving a few to decorate on top. 4. Pour the batter in the prepared liners and bake for 17-18 minutes. Let cool for about 10 minutes in the pan. And cool completely before frosting. 1. Cream butter and cream cheese together until smooth and creamy, about a minute or so. 2. Beat in powdered sugar and blueberry sauce/jam slowly. And beat till the desired consistency is reached. Add in vanilla and the food coloring (if using). 3. 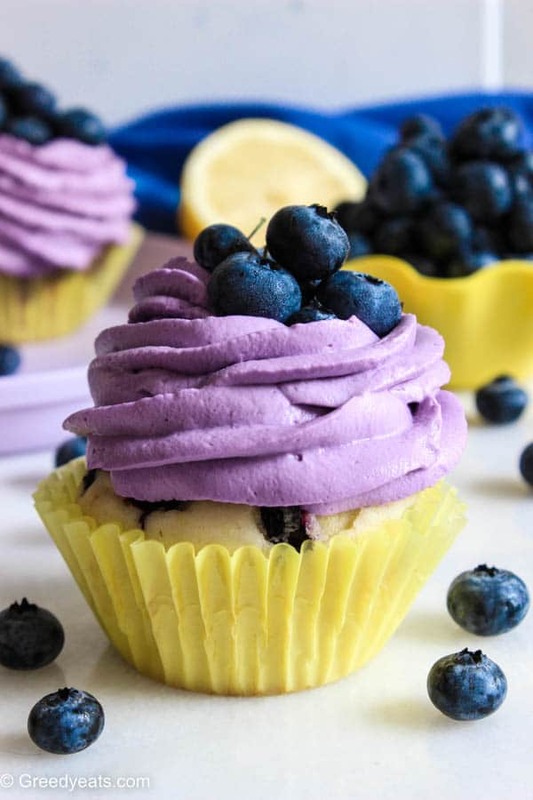 Frost cool cupcakes with the lovely purple frosting and decorate with fresh blueberries. Blueberry flavor in this frosting is very mild. I did not drizzle the blueberry sauce over my cupcakes, but I suggest you do, if you are looking for a well pronounced blueberry flavor. You can even make a hole in the center of your cupcakes and fill it with the remaining sauce. I do it all the time. Delicious! 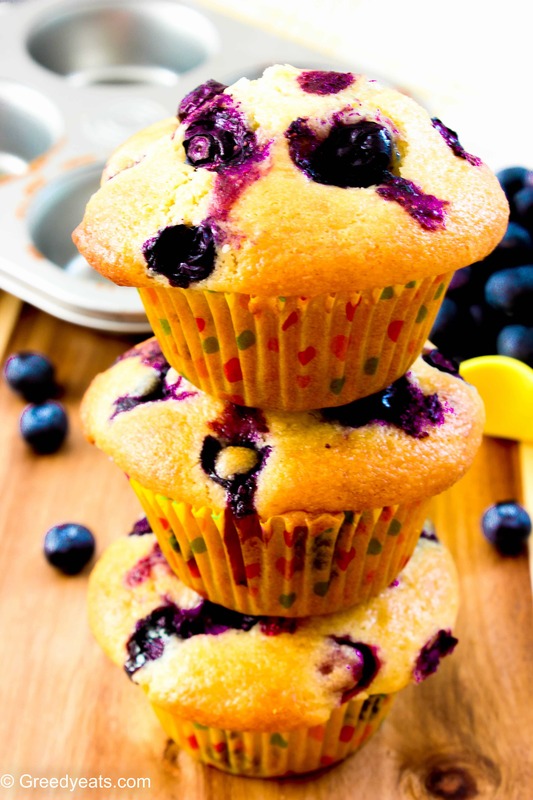 Squeeze the best out of your day with my lemon blueberry muffin recipe. So soft. Unbelievably moist. Bright and cheerful!!! How was your weekend? What did you do? I ate baked a dozen of these simple, bright and sweet lemon muffins. If you know me, you know for sure how I feel for lemon desserts. They are my second love. This is first! Even I never thought I’d say this….